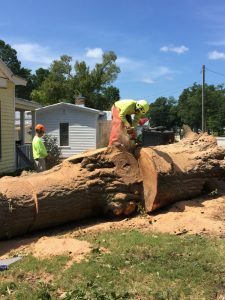 Trees of Carolina, LLC specializes in dangerous & regular tree removal services, lightening protection for trees, tree removal with crane, storm clean up, tree and shrub fertilization, stump removal, trimming tree branches and much more! Trees of Carolina, LLC currently services the areas of Cary, Apex, Raleigh, Holly Springs, Fuquay-Varina and Morrisville, North Carolina. With a certified arborist on staff, along with professional tree climbers, Trees of Carolina, LLC will assist you with trimming tree branches and/or the pruning of your tree(s). We offer cable brace systems for tree support, lightening protection for trees, dangerous &amp; regular tree removal, tree removal with crane, stump removal (after tree removal), tree and shrub fertilization (tree injections), along with emergency storm service (storm clean up). Give us a call today and we will be glad to give you a free estimate on all of your tree care needs.